The lofty mausoleum is located in the centre of the enclosure and rises from a podium faced with series of cells with arched openings. The central octagonal chamber containing the cenotaph is encompassed by octagonal chambers at the diagonals and arched lobbies on the sides, their openings closed with perforated screens. Three emphatic arches dominate each side, the central one being the highest. 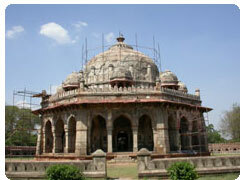 This plan is repeated on the second storey, and a 42.5m high double dome of marble surmounts the roof with pillared kiosks ('chhatris') placed around it. The structure is built with red sandstone, but white and black marble has been used to relieve the monotony, the latter largely in the borders. The haveli of Hakeem Ashanullah Khan, personal physician of the emperor Bahdur Shah Zafar, was a fortress for those who were able to hide themselves here in the 'ghadar'- the Sepoy Mutiny time. The mansion almost covers 2,000-square-yards and appears to be a mohalla itself. It was because of the orders of the Hakeem that Ghalib was given the scholarship to write the history of the Mughal dynasty. Immediately after the Mutiny, British confiscated the house of the Hakeem. 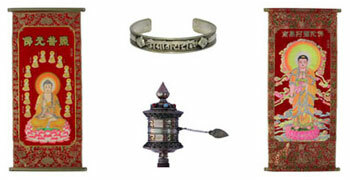 It was soon returned too, but not before it was stripped of the old chandeliers and lamps. The tomb was built by Humayun's senior widow Bega Begam, popularly known as Haji Begam, nine years after his death in 1565 according to some, but fourteen years according to the manuscript of an 18th century text. It is the first substantial example of the Mughal architecture, with high arches and double dome, which occurs here for the first time in India. 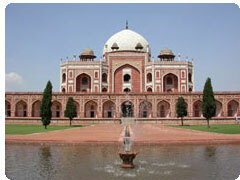 Although some tombs had already been sited within gardens, it is also the first mature example of the idea of garden-tomb, which culminated in the Taj-Mahal at Agra. The enclosure is entered through two lofty double-storeyed gateways, one on the west and the other on the south, the latter now remaining closed. A 'baradari' (pavilion) occupies the centre of the eastern wall of the enclosure and a bath-chamber that of the northern wall.